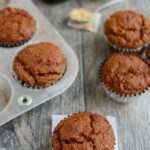 These Pumpkin Gingerbread Muffins are packed with ginger flavor and full of the nutritional benefits of pumpkin and white whole wheat flour. Combine the first six ingredients in a large bowl and stir until well combined. Add remaining ingredients and stir until just mixed. Scoop into greased or lined muffin tins. Bake at 375 degrees for 20-22 minutes.